I'll admit it, I'm a bit of a picky eater. If I'm choosing a restaurant, I want to know that it has good reviews, that they'll have food items I like, that it's not too expensive, and all that. With the new changes to the local listings in search on mobile devices, now I'll be able to see more details about places quickly and make decisions more easily -- whether about restaurants or any other type of place. 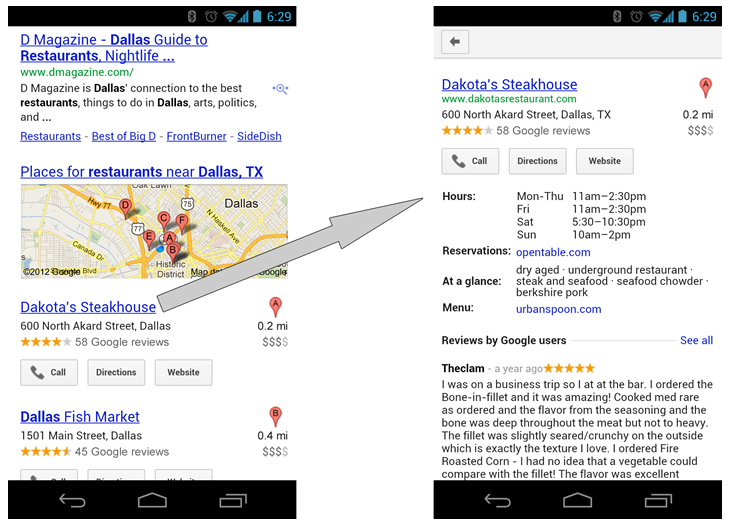 For example, if I search for [restaurants dallas] on my mobile phone now, I'm presented with a list of local results as usual. Now, if I click on the name of the place, I instantly see a summary of the business, with reviews, photos, and more details, similar to the local information you see when searching on your computer. Okay, this place looks fine, but what about the other results from the list? With a simple swipe of the page left or right, I can see the local result before or after this one, to quickly compare the different options and make a decision on where to eat. This is available worldwide on Android and iOS devices. Now I can't wait to go traveling and try this out when I'm hungry elsewhere in the world!